As the Race Coordinators for the 3rd year in a row, David and I would like to thank all of you for your continued support. Each year we learn a little more, we change a few things and we hope for fantastic weather. We really had a home run this year. Thank you family and friends of O.R.S.A. for coming to the signature event Run4Rett. 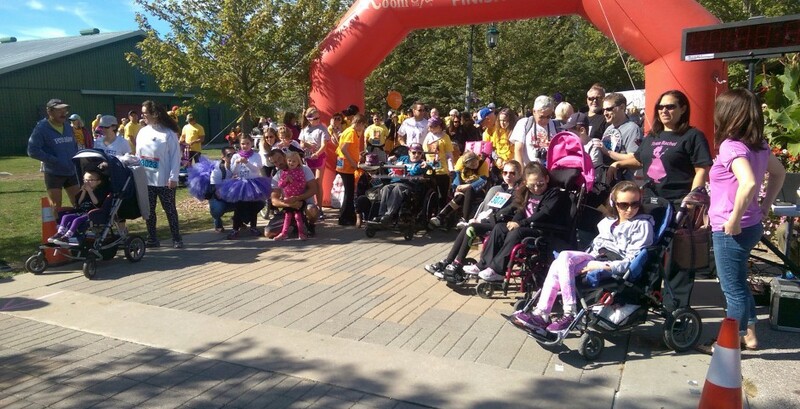 Many walk/run/roll the 1 km or 5 km route, all of us participate for the same reason ”building healthy tomorrows” for those living with Rett syndrome. Thank you to all of those that donated, registered, participated, volunteered and supported the event. The success of this event relies on all of you. To the many volunteers from Dr. G. W. Williams Secondary School, especially Peer Mentor, Nicole Leach. All the O.R.S.A. Executive, Board Members and many of their family members. Karen Congram for the social media support. Valerie Wakonig your assistance on numerous tasks and your team at the resource table. The Hamelin Family for your expertise at the registration tables. The Oak Ridges Lions Club for grilling the hot dogs supplied by Maple Lodge Farms. Eska for supplying the water for approximately 500 participants. 3M for some of the goody bag content and gift basket. Tim Horton’s for the 750 timbits. Starbucks for the coffee. Log Cabin Orchards for the apples. Stonemill Bakehouse for the bagels. To the many donors of the silent auction items, especially Mark Swartz and James Dodds for your numerous annual contributions. The staff at the Richmond Hill Sports Complex. Marty from Emergency Rescue Academy Inc. John Marsden from Speed River Track & Field. Our wonderful family members Olivia, Ian, Kyle & Carrie, Adrian, Barb & Ann for supporting David and I with the Run4Rett and doing whatever we asked of you. Thank you everyone, but especially our loved ones with Rett syndrome. You bring us together. Together we can “build healthy tomorrows”.